FOAM-U, the french OpenFOAM users association, is pleased to announce the second edition of its OpenFOAM users meeting to be held in Nevers on 21st and 22nd of March. This event aims to bring together users of OpenFOAM® in France but also people simply interested in the potential applications of the software. Mentor Graphics will host FloEFD v.16 - What’s New on 23rd February 2017, 11am UK Time & 10am PST. 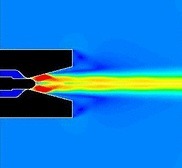 With the latest version of FloEFD software, users can now simulate the sorption (when one substance permeates another) and desorption (changing from an adsorbed state to a gaseous or liquid state) processes of water vapor, which is important for several key markets such as automotive lighting design. Siemens PLM will host Automated Solution of the Inverse Problem in Electronics Cooling on February 14th. The majority of engineering simulations involve a known geometry, prescribed conditions and computation of the predicted results. However, the design question is often posed as the inverse: I have a desired result and need to know what conditions or what geometry will produce that result.